PRINCETON, N.J. -- U.S. investors don't see digital investing tools as a replacement for having a trusted financial adviser. 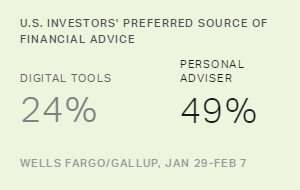 When asked to choose, the largest segment of investors, 49%, continue to prefer having a strong relationship with a personal financial adviser, while 24% say digital tools are their top investing resource. The smallest share of investors, 18%, prefer having on-call access to a financial adviser. Investors are no more inclined today than they were a year ago to favor digital advice over more traditional resources. These findings are from the latest Wells Fargo/Gallup Investor and Retirement Optimism Index survey, conducted Jan. 29-Feb. 7, 2016, among 1,012 U.S. investors. Approximately 40% of U.S. adults meet the survey's criteria as investors -- having $10,000 or more invested in stocks, bonds or mutual funds, in an investment or retirement account. Although most investors don't name digital tools as their preferred source of investment advice, a different measure getting at the same issue finds the majority saying they want a combination of digital tools and personal advice. When given four options for how to receive financial advice, about four in 10 want their advice mostly from a financial adviser but with an online or digital component. Another 27% want mostly digital advice with access to a financial adviser, meaning two-thirds of investors favor some sort of blended approach to advice. 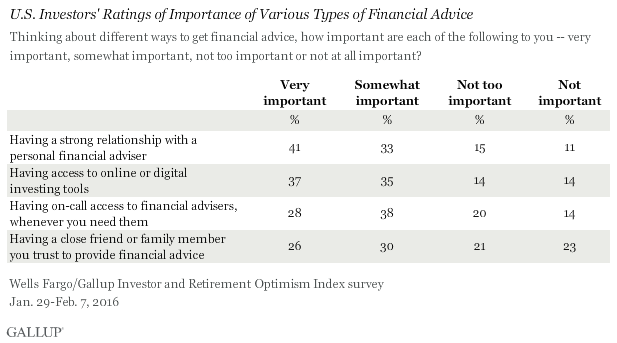 One in five still want their advice to come solely from a financial adviser, while just 6% -- down slightly from 9% last year -- are comfortable with relying solely on digital tools. The percentages of investors favoring various advice scenarios are largely unchanged from a Wells Fargo/Gallup survey last May. A slightly different picture emerges from investors' separate ratings of four main sources of financial advice. Investors give the highest importance ratings to having a strong relationship with a personal financial adviser, with a combined 74% rating it as very or somewhat important. But online or digital tools are right behind, with 72% rating them as at least somewhat important. Overall, 66% rate on-call access to financial advisers as at least somewhat important, and 56% say the same for a trusted friend or family member. There is a strong age skew in these preferences, with younger investors much more likely than those 65 and older to value digital investing advice: 47% of investors younger than 50 call digital tools very important, compared with 36% of those 50 to 64 and 21% of those 65 and older. However, when it comes to their preferred approach to receiving advice, even 18- to 49-year-old investors lean toward having a strong relationship with a personal adviser over accessing state-of-the-art online digital tools, 48% vs. 31%. This preference widens to 53% vs. 25% among 50- to 64-year-olds. Investors 65 and older also lean toward personal advice, but a quarter -- the most of any age group -- prefer using on-call advisers. Digital investing tools offer investors powerful analytics-based investing insights at the speed of the Internet, and with the convenience of round-the-clock access. Investors recognize the value of these tools, but have yet to view them as a replacement for someone they can speak with or have developed a relationship with over months or years. For the foreseeable future, then, the growth in consumer adoption of digital tools may come in how investors integrate these tools with human advice. For now, the largest group of investors prefer to rely mainly on personal advisers and add digital input to that. The next step could be heavier reliance on digital advice, while maintaining some input from a personal adviser. But with nearly half of young investors still choosing personal advisers as their preferred source of advice, it is likely to be a long time before investors take the next step down the technological path: forgoing human advice altogether and going solo with digital tools. Results for the Wells Fargo/Gallup Investor and Retirement Optimism Index survey are based on questions asked Jan. 29-Feb. 7, 2016, on the Gallup Daily tracking survey, of a random sample of 1,012 U.S. adults having investable assets of $10,000 or more. 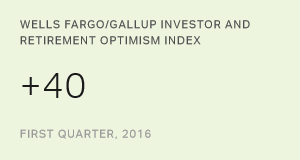 The Wells Fargo/Gallup Investor and Retirement Optimism Index is a broad measure of U.S. investors' outlook on their finances and the economy. 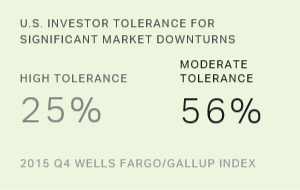 Most U.S. investors in a recent Wells Fargo/Gallup Investor and Retirement Optimism Index survey said they have high (25%) or moderate (56%) tolerance for sharp market downturns. Just 18% said they had little or no tolerance.